Toronto Mini Maker Faire was awesome! There were about 80 booths, and something like 3000 people came and saw the faire, so it was a vast success, nearly an order of magnitude bigger than the Ottawa Mini Maker Faire last fall. I personally had a wonderful time chatting with people at the hacklab booth, showing them the Train Overlord, my sensebridge stuff, our 3D printers, etc. etc. For the Train Overlord we had an awesome demo where you could pan and tilt the laser and move the train forward and backward using my old iPhone - totally wirelessly with a nice touch GUI. It was a smash hit with the kids, and it astonished a lot of adults as well. I gave a lightning talk Saturday evening about DIY Transhumanism, which was very well received - a lot of people came up to me afterwards and the next day to say that they really enjoyed it. Other super cool things I saw at the Maker Faire included Darin's Loud Monkey project, where old sound making toys are hacked to have sound jack outputs, which you wire into huge boombox speakers, creating awesomeness from up to a mile away. And Natalie's bluetooth LED purse, which flashes bright lights when her cell phone gets a call. And Alan's awesome claw robot, which he let me use to crush some apples :-). And so many new things by people I've never met - including an awesome tilting game rig for the XBOX, 3D animals made by laser cutting cardboard and glueing layers together, a space invaders latex shirt, an awesome mechanium-wheeled robot built by a student team, really cool light-reactive sound stuff by a group making exhibits for a science center, some cool wearables stuff by DDMIT (which also had really nice 3D printed objects done by a commercial 3D printer), the awesome Obama Board by Ashley Lewis (keys play words from his speeches, so you can assemble you own Obama speech!) And so many more things, it was such a great display of the DIY community here in Ontario, I'm looking forward to next years event already! 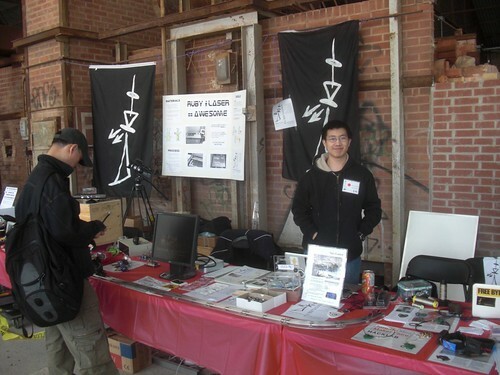 Check out my complete Toronto Mini Maker Faire 2011 Flickr Set. See also kwartzlab's post, which links to a lot of other blogs and flickr sets. See also Darin's excellent Toronto Maker Faire... wow! It would be great to see if they have those heavy-powered laser cutters that industries use. Back home, industrial factories also use water jet cutting perth in cutting varied materials with simple accuracy. I surely missed the chance of going into that fair! If there will be a fair of that kind this year, I will not let that opportunity pass by. A colleague told me that a lot of equipment is being sold in that event like the haas rotary table that I am looking for. Actually, laser cutters in the industry are now easy to use. They're green light lasers that are made for different purposes.